It’s been a couple of years since I started getting into plants (see Growing a Green Thumb), and it’s high time for an update for those of you interested in tiny-apartment gardening. 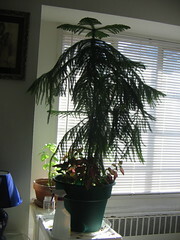 The “Admiral” Norfolk Island Pine is still around, repotted in a larger, sturdier 13″ plastic pot with lots of Miracle Gro Moisture Control soil. I was a bit worried that the stress of moving from its old pot would retard its growth, but quite the opposite, the Admiral has shot up, sprouting a new branch and lengthening its old ones with bright, green, needly shoots. I also attempted to correct its asymmetric angle of growth in repotting, correcting the base angle of the trunk to vertical, and the new shoot now grows in the proper direction. Daily rotation and spraying are now part of the Admiral’s routine. 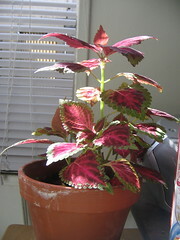 I’ve also rerooted a few coleus cuttings from Amy in a terra cotta pot. 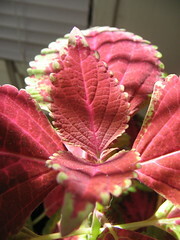 Coleus is a lively grower, propagating easily from cuttings and shooting up like crazy with lots of watering and sunlight. Initial growings proved to be rather unwieldy and vinelike, but subsequent propagated generations have been treated with strict pruning and daily rotation to even things out. 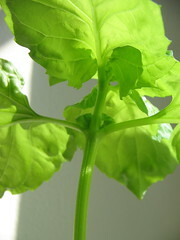 Already the coleus you see in the photos above (from a month ago) is twice that height. 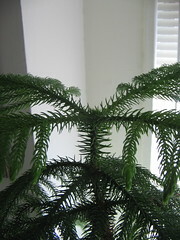 As you can see from this photo (also above), I’ve stuck a few coleus cuttings into the Norfolk Island Pine’s pot, sharing the soil and adding a bit of variety. Also from Amy, I have a lettuce leaf basil plant in a clay pot, whose fragrant leaves have made for delicious salads and stir fries. (There was an older basil last year which survived for a few months, but was later taken over by scale bugs, so I had to throw it out.) 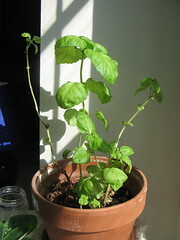 This basil plant seems to be getting past its prime, though, browning away in its lower regions and not growing new leaves quite as fast as I would like. I tried rerooting a basil cutting in water and replanting it in the same pot, but its performance so far has been lackluster. It may be time for this one to retire soon, perhaps in a last, mournful garlic basil chicken stir fry. 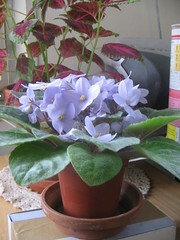 And finally, my pride and joy, a new African violet (also from Amy) which, with careful tending and infrequent watering, has bloomed into a forest of lovely, glittery lavender flowers. It took about a month for all of them to come out, and they’re just past their peak — but with a few buds still forming to replenish the bloom. I’d say this baby still has a good month of flowers left on it before they wither and drop off. 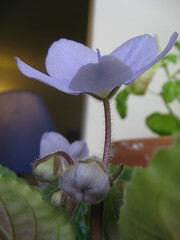 You can watch the progress of the bloom in my African Violet Photoset. Over the summer, I’m considering the feasibility of a ledge planter to get some stuff out into the sun. I’m not sure what I want to put in there yet. Also, there’s a jar of simple wheat grass for Pandora to nibble on, for her digestion, but that’s not really worth photographing.